Dirk Gently's Holistic Detective Agency returns for season 2 a more confident and structured series while still being delightfully weird and entertaining. Last year, BBC America premiered Dirk Gently's Holistic Detective Agency, another adaptation of the series of novels written by Douglas Adams. 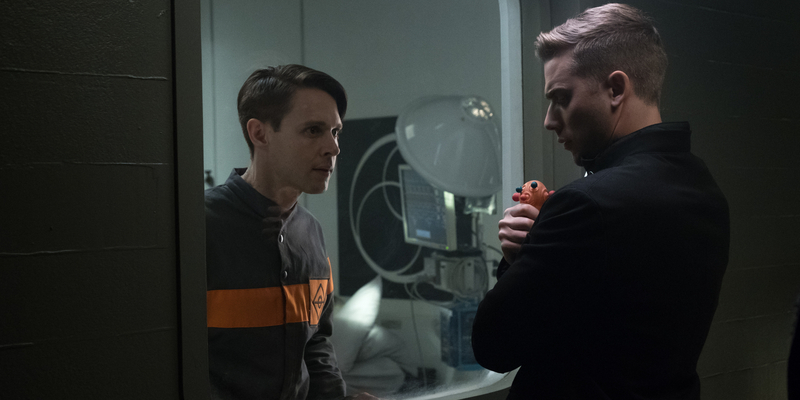 This time, the series came from prolific writer Max Landis and starred Elijah Wood, along with Samuel Barnett as the eccentric Dirk, a detective who is seemingly always in the right place at the right time for fate to reach out and guide him. The series reveled in the bizarre, presenting one outlandish scenario after another, as a case of a missing girl turned into a story of government sanctioned experiments, body swapping, and even time travel. As much as the series threatened to teeter into absolute nonsense, though, it somehow kept it head and, more importantly, its heart, as no matter how weird or outlandish Dirk Gently became, it was, in essence, still a story about Dirk's bond with the sad, stalled Todd Brotzman (Wood) and how the unlikely detective with a penchant for bright yellow jackets might find a place in Todd's life amidst a slew of strange acquaintances and adventures. The first season was a prologue of sorts, introducing a peculiar set of supporting characters, like Todd's sister Amanda (Hannah Marks) and her Pararibulitis affliction (a fictional disease that causes her brain to hallucinate her body is in horrible pain), and the tough-as-nails security officer Farah (Jade Eshete), with whom Todd has developed an equally strong bond that also hints of a potential romance. The series also introduced the unkillable Bart (Fiona Dourif), a holistic assassin who develops an unlikely bond with Ken (Mpho Eklund) a technician who had the misfortune of being kidnapped by her. For the most part, Dirk Gently season 1 managed to tie up its various story threads by the end of the first season, resulting in Dirk, Todd, and Farah forming an actual Detective Agency thanks to the largess of the latter who suddenly found herself flush with cash. It was as though the first season was effectively a prologue, an in-depth introduction to these characters and their world, and now that it had initiated the viewer, created its own unique vocabulary, established a rulebook (or confirmed that there was no rulebook) Dirk Gently could get to the task of being a delightfully weird and satisfying series. But the season 1 finale threw a big curveball that effectively set up the second season by halting the progress of the newly formed Holistic Detective Agency after Friedkin (Dustin Milligan), the daft government agent kidnapped Dirk, Todd actually manifested the disease he only pretended to have, and his sister ran off with the Rowdy 3 (only to be cornered by the same government agency that nabbed Dirk). The search for a new consistency was postponed, and at the start of 'Space Rabbit', Dirk Gently returns to its familiar ways by leaving behind the sci-fi-tinged madness of season 1 for a fantasy mash-up that includes a magical land of Wendimoor, a missing sorceress, and mustachioed John Hannah as a mage at the center of a new mystery. Unsurprisingly, the series has a number of plates spinning at any given time, yet through the first few hours at least, it never has a trouble keeping them going. 'Space Rabbit' concerns itself mostly with getting caught up with every character after the cliffhanger finale last season. Todd and Farah are on the run and find themselves in a weird town of Bergsberg Montana where they run into Sheriff Sherlock Hobbs (Tyler Labine) a small-town lawman eager to join up with and buy into the weirdness he's suddenly a part of. Meanwhile, Friedkin continues to test Dirk and a number of other subjects with little success, while Amanda and Vogel (Supernatural's Osric Chau) push her visions to the limit to try and track down the remaining members of the Rowdy 3. The introduction of the admittedly (and perhaps even deliberately) hacky-looking Wendimoor works largely because of the groundwork set by the first season, and because, with the introduction of meek, put-upon, forty-something Suzie Boreton (Amanda Walsh), Dirk Gently continues its theme of sad, lonely, disengaged people finding purpose and emotional connection by embracing the weirdness of the connectivity of all things. Suzie's situation – a delinquent kid, negligent husband, and insufferable boss – set up a familiar Cinderella-like scenario that certainly serves the needs of the season's genre mash-up. And though he's only barely introduced, Hannah looks to be a standout this season as he chews the scenery in a manner befitting a show that's as off-the-wall as this is. How Landis plans to integrate Wendimoor into a story that already has sweeping government conspiracies, the mystery of Dirk's origins and the extent of his abilities (if, in fact, he actually has any), not to mention the sleepy little town of Bergsberg and all its inscrutabilities will be the biggest question for a series that likes to obfuscate things just enough to keep its audience guessing. But, if nothing else, Dirk Gently earned the benefit of the doubt last season, untying what seemed like an impossibly complicated narrative knot and delivering a mostly satisfying story that actually left you wanting more. Doing so was no small feat, so in returning for a second season Dirk Gently has to take things up a notch without losing sight of the characters and the emotional connections, without which the series simply wouldn't work, no matter how weird things became. It's a promising start to a new season that comes with an added degree of difficulty beyond fitting fantasy into the mix. But if there's any show that can take incongruity and make something entertaining out of it, it's this one. Whether or not season 2 will be as magical as the land of Wendimoor suggests remains to be seen, but Dirk Gently is certainly off to a strong start. Dirk Gently's Holistic Detective Agency continues next Saturday with 'Fans of Wet Circles' @9pm on BBC America.